Convert all live chat conversations to leads and instantly add them to your sales funnel. Olark offers the easiest way to boost your lead generation efforts, help solve issues and understand your customers better by chatting live chat on your website. ClinchPad is an alternative to traditional CRM software and is the right fit to improve your sales pipeline management efficiency. Track sales leads and better manage your sales cycle using ClinchPad's integration with Olark. Providing a live chat option on your website is a simple and effective way for prospective customers to get in touch with you instantly. These one on one sessions give customers an opportunity to seek additional information required to make the buying decision. Following up with these leads gives you a better shot at taking them through the sales pipeline stages in a streamlined manner and eventually closing the deal! Now, instead of copying over the chat transcript of a completed conversation into a sales software manually, all you have to do is integrate ClinchPad with Olark. Once that's done, a lead is automatically created in our small business CRM with all the information provided by the prospect in the conversation. To make lead management easier, all subsequent conversations with the same propsect are associated with the same lead. This brings in much needed sanity to your sales pipeline management efforts! Sign up for accounts on both Olark and ClinchPad if you don't have them already. 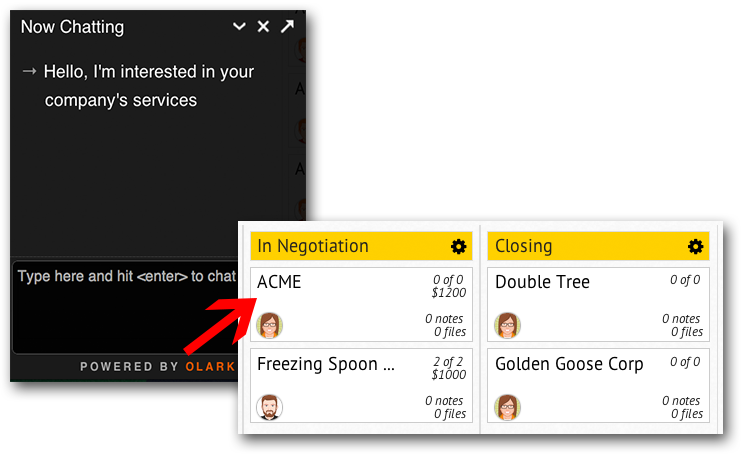 Install the Olark live chat widget on your website. Follow the instructions in this support article on integrating ClinchPad with Olark. You're done! Now anytime a Olark chat is completed, it'll appear as a lead in ClinchPad.